This day belongs to SammyM. "So classically beautiful! Be part of the global ethical shift." Like living in a fairy tale, we've been blessed by eBay with some amazing new powers, allowing us to turn every dollar we raise into an additional dollar during this holiday season. With our newly vested super-strengths, the U.P. Super-Heroines pledge to only use our new power for good, justice, and the education of the youth in need. Hand woven Alpaca button cape donated by Ten Thousand Villages. 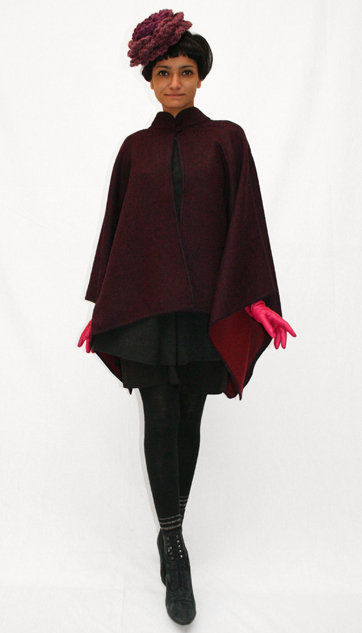 Shop the cape at their online store. Hot pink gloves donated by Candace Yu, hand-knit corsage worn as hat donated by Dennice Mankarious, wool tights donated by Cat and vintage boots from eBay. Schiaparelli would be proud of your Shocking Pink. c'est excellente! how does the "hat" stay on your head? I've donated once already but will send some more bucks your way; your daily efforts have brought a lot of pleasure to me. With eBay's generous offer, December seems the perfect time to make that donation count even more. Your commitment to this project is inspiring. Tu es si jolie avec cet ensemble. Bravo mille fois! scary. tagged this pink for the rink. class. get your ice-skating on, tis the season and the get up for it ..! congrats on the ebay deal.. expect dollars to double from all of my clan! believe. these photos are like a holiday gift. xmas seems to have come early this year. and while we're on the gift giving topic, last time you did the Green Team thing it said eBay would donate up to $25,000 but it seemed like you only raised around $10,000. not bad, but still that's a lot of corporate dosh leftover in their coffers. i hope this time around all of us supporters will really take advantage of their offer and donate to your goal, so the kids can get ALL of those corporate dollars!!! can we get some close ups on your shoes? you've got great ones. Hurrah for the matching program! Education is the best gift the kiddos could wish for . . . The triple layers (Uniform, underskirt, and cape) make a nice shape/profile. Outstanding, gorgeous, stunning. there aren't enough adjectives for this outfit. LOVE it!! what a fantastic offer from ebay!! hmmm...I am pledging now to cut down abit on my usual Christmas spending for such a worthy cause. Sheena...& this is the best time since its "buy one get one free" time! !I am pretty sure, all your "fans" will take the ebay challenge to the full advantage for the U.P - I mean - kids ...kids ...kids....kids....BTW you look elegant in today's outfit esp: the cape & the hat.. Very striking and glamorous! Love the colours and shape of the outfit. so classy and bold. i love it! Scully tagged this Cranberry & Bosenberry! I LOVE this Eliza Schiaparelli would be proud! You look as beautiful on the outside as you are on the inside. The fourth photo should be framed and hung on the wall, you're gorgeous. Love. Love. Love. Especially the crochet flower. Debating about getting my grandma to make me one as well! AND, I love your gloves! classy, rich, with a hint of mystery. Wow!! What a stunning start to the "Holiday Mission"!! !Love the elegance of the gorgeous oufit today.The cape & the 'cap' are awesome.Congrats on the inspiring eBay deal.Hope'n pray that each fan of The U.P. will take this as a X'mas challenge to take advantage of this awesome deal. Assure you to encourage more fans in the month of December. This outfit looks so sophisticated and 20's. I love it. This look has it all ~ it's adorable! i LOVE that cape and i love what you're doing. you go girl. ten thousand villages is such a great store for more than clothing. check out all their fair trade ware. stunning! love the cape & gloves. You get an extra donation this week for this. One of my all time favorites. Who can avoid a smile as they watch you go down the street! so beautiful. you look like you stepped right off the runway. I love the cape! This whole outfit is put together pefectly! Cyn tagged this Fierce !!! My favorite of all !! and congrat's for the gloves that really add something !! well done !! I really love this outfit!!! The cape is just so beautiful! And yes, all this winter story looks like a fairy tale (it was the first thing i thought when this image came up). This is much better! You are getting my compliments and my money. Well done! this is my favourite look so far! LOVE the hat and cape missy. You wore this dress on my birthday and it is stunning! I love it! This outfit is amazing. I am in love with the hat and the little stripes in the tights. Every part of this outfit is gorgeous!